General Abdel Fattah al-Sisi is an unannounced, unofficial candidate for president, but the announced, but still unofficial campaign for him to run has long been strong. Immediately after deposing President Morsi on July 3 he denied any intention for seeking office, but has since expressed an openness without declaring himself either way, though he dropped strong hints he would run if the constitution was ratified with strong turnout. It has, and Sisi-mania has persisted, with many politicians offering their unqualified support should he decide to announce his candidacy. There is even a lawsuit filed to compel him to run for president. ‘The good’ represents the massive demonstrations on June 30 which demanded early elections to remove Morsi as president. June 30 has been billed as a new revolution, but also as a corrective extension of the original January 25 uprising against President Mubarak. To others, June 30 is the counter-revolution, less against Morsi than for the state/regime which had buckled in 2011, but not collapsed. It is unknown whether or not General Sisi is behind this effort or if other state forces desire him, or, if it represents simply the will of a great portion of the populace. Almost all observers predict that if Sisi were to run for president he would win in a landslide. 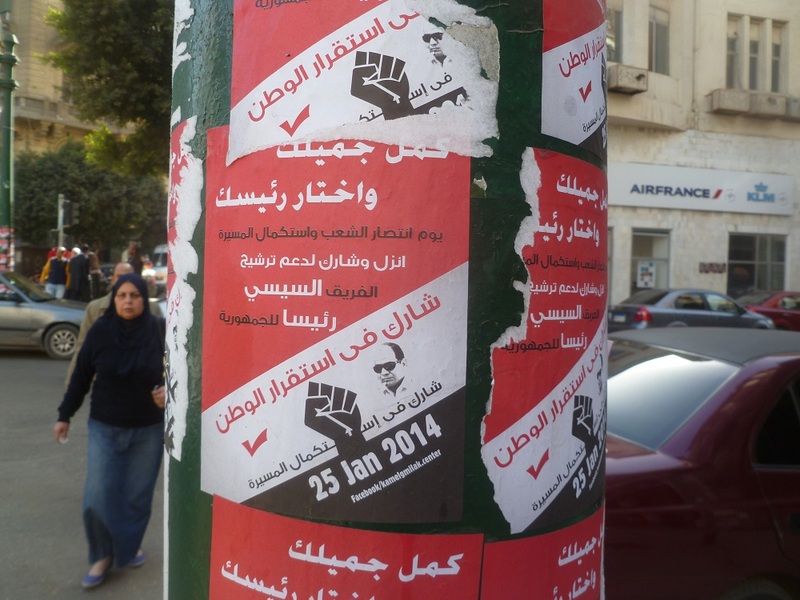 Will January 25, therefore, be repackaged as the launching pad for the next president of Egypt? If so, will the original revolution lose more of its luster among a weary population, or, if not and, will the June 30 extension restore much of what January 25 meant to topple? Mubarak, of course, was a president from the ranks of the military. January 25 was originally selected as the start-date for the revolution because of its coincidence with the national observance of Police Day. It was a protest against the police state and its brutality, but also against corruption in general throughout the regime. Incidentally, the Interior Ministry has called on the public to rally in Tahrir on this day – without mentioning Sisi specifically. He has also floated the idea that Police Day be moved to June 30, to coincide with the revolution against President Morsi. Let us suppose General Sisi removes his uniform, runs for president, and wins his mandate. This may reflect very poorly on Egypt abroad, giving ammunition to those who call what happened on July 3 a coup d’etat, however popular. He has the right to run, of course, but is it wise? That may all depend on the type of president he will be. Will he restore the Mubarak state and rule similarly with token appreciation for parliamentary politics? Or will he honor the original revolutionary demands and reform both the police and the culture of politics, presiding over a true and ongoing democratic transition? Might he perhaps, with his military background and popular backing, be the only one who can accomplish this? Doubters say the manner in which he has presided over Egypt since July 3 reflect a very low possibility of the latter. The violent crackdown against the Muslim Brotherhood, the controversial protest law, and the media campaign to tarnish original revolutionary icons all suggest resuscitation of the dominant state. Furthermore, electoral flexibility passed by the constitutional assembly to the interim president – viewed in this framework as Sisi’s puppet – allow great maneuverability to shape the coming parliament along conciliatory lines. But throughout the previous three years there has been a lingering sentiment, now a fully raging fire, that Egypt, especially through the Muslim Brotherhood, has been the victim of a conspiracy. Morsi, it is said, won his victory through fraud and foreign pressure, recalling the Brotherhood monitors who declared his victory long before the official results were counted. Judges who participated in the alleged charade are now being investigated. Egypt’s judiciary – alternately reviled and respected among the people – will have to judge these matters. Their decision either way will be filtered through the lens of some conspiracy. But it reminds of the question ongoing since revolutionary trials began: Who killed the protestors? Has the judicial system let murders off the hook? Were police shooting in defense of stations attacked throughout the country? Or was there simply a lack of sufficient evidence to rule against anyone? And though many analysts dismiss these thoughts as the knee-jerk reaction of any autocratic regime that comes under popular pressure, conspiracy theorists have a powerful retort. Look at Syria, Libya, and Iraq before that. Their states and armies are all victims of foreign interference. Shall we allow Egypt to fall next? Or, through Sisi, is it falling now? Pro-Morsi forces are also calling for mass demonstrations on January 25, at Tahrir Square and throughout Egypt. They are now warning of civil war, even as they mobilize. The general is at the nexus of many attempts to define January 25 amid ongoing Egyptian turmoil. The success of January 25, 2014 to push Sisi to the presidency, as well as the manner in which he may eventually govern, will define the ultimate packaging of the revolution.